This frugal living blog provides frugal news, tips and ideas on a wide range of topics to help you live well with what you have. Sign up for one of our *Stay In Touch* options on the left side below. Visit our main website and forum with links below. Thanks for stopping by! Growing your own food doesn't have to be an expensive activity. There are plenty of ways to cut back the costs and be earth-friendly as well. You can do this by giving a second life to items that have outgrown their initial purpose. One such item that you can find in abundance and use in your garden is a soda bottle. Even if you don't drink soda, you can find these everywhere or ask family and friends to save them for you. To help keep the soda bottles out of the landfill, here are three ways that you can reuse them in your garden. They all work well for apartment and small space gardening. Radon is the second leading cause of lung cancer, next to cigarette smoking. Radon is naturally present in granite, but the various levels in different brands is wide ranging. Some of the popular granite countertops may emit radon at dangerous levels. A CBS news clip discusses ways to test countertops with an expert in radiation testing. The EPA doesn't believe sufficient data exists to conclude that the types of granite commonly used in countertops are significantly increasing indoor radon levels. While radiation levels are not typically high, measurement of specific samples may reveal higher than expected levels on a case-by-case basis. How long did the EPA look away at cigarette smoking while others presented research opposite to their thoughts that second-hand smoke posed no risks to people around smokers and indoor environments. If you already have granite countertops, you might want to do an at-home test kit to find out what your level of exposure is. View the video. An existing car lease may be a good deal for you. Find a driver that wants to end their lease early without paying the balance due or early termination penalties. If you assume the lease, you can avoid the usual hefty down payment. Websites such as leasetrader.com and swapalease.com connect the two sides of such deals. From Cathie Gandel at AARP Bulletin . • For free advice, join a garden club, ask questions at a local nursery or call your state's cooperative extension service. • Take photos of your flowering bulbs, so that in the fall you don't buy what you already have. • Sprinkle crushed eggshells on your soil. They're a good organic fertilizer, plus they'll keep snails, slugs and cutworms away. • Don't buy that costly once-a-year tool like a garden tiller or leaf shredder. Rent it. • Don't forget the dump. Frugal gardeners have found bags of rotting soil, pots, trellises and even hoses there. It's that time of year for weddings, when many couples begin their new lives together. In our world of disposable things, it's great to find a cookware that will last forever. We purchased a 20-piece set back in 1989 and are still using it. When I use the polish it looks like a brand new set of cookware. What a blessing it's been not to have to continue to replace pots and pans as I see so many of my friends doing. NatureSeal is a five-ply cookware with tight-fitting, self-sealing lids which decreases nutrient and flavor loss by cooking foods in their own juices. Too often the nutrients and flavor are boiled right out of food. Good health begins with healthy food. Stainless steel is a great cooking surface because of its durability and cleanliness. Because it's a poor conductor of heat, two layers of pure alluminum and one layer of alluminum alloy are sandwiched between the two layers of durable 18/10 stainless steel construction. Foods cook in their own juices making meals easier to digest than foods cooked in oil or grease. Foods shrink less and the nutritional value loss is minimized. The water seal keeps flavor and nutrition in the food. A vapor seal is created by the tight fitting, self-sealing covers. Tight seal allows food to cook in own juices. Reduces need to peel, core, boil or fry. This five-ply, aluminum core and stainless steel cookware can be used at lower temperatures, which makes cooking more energy-efficient. Nature's Seal is available in a 12-piece set and also as open stock pieces. Get more information and buy at wholesale prices. The economy today is putting a strain on numerous bank accounts. It is essential to have a complete budget that covers all everyday expenditures and still leaves room for savings. Many people forget to include some crucial expenses which can sabotage an otherwise thoughtful budget. Here are 15 things that people often forget to budget for. There are five major stages (or aspects) to every mission. Objective acquisition, reconnaissance, planning, execution and debriefing (a.k.a. reflection). In order to have a successful mission and a successful series of missions to make up a campaign, each aspect has to be done and done well. Objective acquisition: decide on what you want, whether it be a diplomatic goal, a rescue, an attack, etc. Recon: gather as much information as possible within a reasonable ore required timeline about what you will be up against, where you will be and what resources you will have at your disposal. Planning: use your recon to plot out your execution. Your entry points, rally points, landmarks, exit strategies and back-up plans. Execution: follow your plan. If the situation leaves your control and deviates from the plan, refer back to your recon. Debriefing: The importance of this stage is very often underrated but it is often the most important. Gather and reflect on all the information about the execution. What went wrong, what went right, and anything else you noticed along the way that might help the recon process of future missions. Learn not only from your mistakes, but also from your successes. These are tools I was given as an NCO in the US military and now that I’m once again a civilian, I find that these tools help me in every day life the same way that they helped me in the armed forces. My son is fascinated by the military and is very proud that I am a veteran. My experience has given me a resource to teach him things that he might otherwise find uninteresting. He is at the age now where he needs to start learning about managing his money, and I found that these five aspects of a combat mission have a profound parallel to successfully managing one’s finances. Here is the plan I created for him: Read the entire article. Over the last few years, I couldn’t help but notice that several churches in my local area have run personal finance programs of various kinds, such as Financial Peace University and so on. Having sat in on a few of them, I can certainly say that they’re often well-attended, with enthusiastic people taking notes and often asking good questions, too. This left me wondering why churches are such a hotbed for personal finance education. I’m not so much interested in the reasons why churches would host such events, but why churches happen to be the place where such events find great success. More importantly, is there anything useful in that relationship that could be applied to those who seek financial success without such groups? In order to figure this out, I’ve had conversations with a few different pastors and a lot of different church members over the past year along these lines. Why does your church host personal finance programs? Do you feel they’re successful? Why do you feel that they’re successful? The answers were actually pretty consistent – and fairly insightful. Read the entire article. Each week, The Simple Dollar presents a low-cost meal (or a meal that demonstrates a lot of options for cutting costs) that their family eats for dinner and enjoys. Many of the recipes will be vegan or vegetarian due to dietician recommended diet, with options to add other ingredients for non-vegetarians. Read about Enchiladas. How about Fajitas? Getting Rid of Stuff: The Price Was Right! We've all confronted the queer dilemma of 'I've got this (fill in the blank) and I can't even give the thing away.' Here's how I solved that problem and had a good laugh besides. Read the entire article. These can add up to $5,000 or $10,000. You can negotiate with the seller to split them with you. The seller may be willing to pay most or all of these fees. The Title Company will give you a detailed estimate of these fees prior to closing. Examples include .... .
As an expected increase in the cost of raw materials looms for late summer, consumers are beginning to encounter shrinking food packages. So far, the changes are most visible at the grocery store, where shoppers are paying the same amount, but getting less. For Lisa Stauber, stretching her budget to feed her nine children in Houston often requires careful monitoring at the store. Recently, when she cooked her usual three boxes of pasta for a big family dinner, she was surprised by a smaller yield, and she began to suspect something was up. Read the entire article. In 2010, more than 365 million acres were planted worldwide with genetically engineered (GMO) seeds. The U.S. leads the world with more than 165 million acres of GMO crops, mostly Roundup Ready® crops. Monsanto owns patents on the genes of more than 93% of soybeans, 80% of corn, and 95% of sugar beets planted in the U.S. -- all genetically modified to be resistant to the weed killer Roundup. In 2007, more than 185,000,000 lbs. of Roundup were applied to U.S. crops, the year the Bush administration halted reporting of the herbicide's application rates. In 1992, U.S. Vice President Dan Quayle announced that GMO foods would not be "hampered by unnecessary regulation", freeing Monsanto of the burden of independent testing or labeling of GMO foods for the American public. On January 17, internationally recognized plant pathologist Dr. Don Huber, wrote a letter to USDA Secretary Tom Vilsack warning of the discovery of a new pathogen and a possible link between Roundup Ready® (GMO) corn and soybeans and severe reproductive problems in livestock as well as widespread crop failure. Less than 3 weeks later, the Obama administration approved 2 new Roundup Ready® GMO crops, set to be planted this spring. Read on about Dr. Huber's discovery. Do NOT Kill Ladybug Larvae - Do You Have Them On Your Plants? This is the larvae of a ladybug on a leaf of a spirea bush. We have oodles of them all over our plants that normally attract aphids. Each year we have more and more of these God-driven aphid eaters. Many people have no idea when they spray chemicals on their plants (and themselves) to kill these precious critters that they are killing their army of protection from aphids. They are in this stage, growing from tiny to small, for about two weeks. 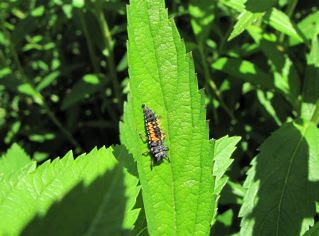 One larvae will eat about 400 medium-size aphids during its development to the pupal stage. Every year our spirea bushes begin to put on green and grow new shoots and get filled with aphids. Right behind all of that are these little critters that gobble up the aphids so they can grow into ladybugs, who will then lay eggs and begin the process all over again. Once the eggs hatch, the larvae will come out and start looking for something to eat. They will look for tiny mites or aphids and they should find plenty because the mother found the perfect leaf to lay her eggs under because of the abundance of food for the larvae to find. Newborn larvae look sort of like tiny alligators. After only a few days, the larvae will be large enough to begin to molt (shed their skin), and they keep molting for as long as they are growing. You can find the molted skins on leaves if you look very hard. After a couple of weeks of growing, the larvae will start to change into something that looks like a shrimp. It will find a leaf to attach itself to and it will seem to fall asleep for a few days, but it is not sleeping at all. During the pupa stage, the larvae are going through a metamorphosis into a ladybug. And we all know what ladybugs look like. Growing M&M's In Your Garden - Really? Available in Caffeine-Free Formula Too! • That man is the richest whose pleasures are the cheapest. • The cost of a thing is the amount of what I call life which is required to be exchanged for it, immediately or in the long run. • A man is rich in proportion to the number of things he can afford to let alone. • Go confidently in the direction of your dreams! Live the life you've imagined. As you simplify your life, the laws of the universe will be simpler.